Almost without fail, one of the first questions a patient with a meningioma asks is, “What caused my tumor?” Many possible etiologic factors have been proposed during the last century. Solid epidemiologic evidence for most of these factors has proven fleeting. The availability and application of molecular biology techniques to investigate meningioma tumorigenesis, however, has revealed many insights into how these tumors develop and progress on the cellular level. 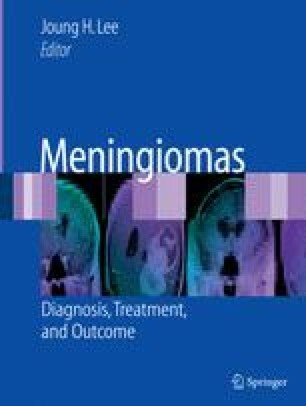 Not only will further understanding of meningioma tumorigenesis answer the patient's “first” question, it may also lead to a better molecular classification to complement the current morphologic classification of meningiomas (see Chapter 5) and, of course, hopefully lead to novel therapeutic approaches to treat these tenacious tumors. Somewhat confounding efforts to elucidate the cause of meningioma is a lack of universal agreement on the cell of origin for all meningiomas. Most meningiomas likely arise from mesodermal arachnoid cap cells normally found at the apex of arachnoid granulations.1,2 Cleland, in 1846, is credited with first correlating these cells to meningioma formation.3 They are found adjacent to major venous sinuses where the majority of meningiomas occur, and the normal arachnoid cap cells histologically resemble meningothelial meningiomas. However, meningiomas may occur at unusual sites such as choroid plexus,4,5 within bone,6,7 or, very rarely, outside the neural axis.8 For these tumors a different cell of origin may be possible, or they may arise from heterotopic meningothelial rests.